How would I declare my Profits and/or Losses from my market activity? Do I bifurcate between speculative business income and non-speculative business income? Also, he asked me about the books of accounts that I’m supposed to maintain. Thanks to my ignorance I had no answers to give him. I was an eager learner, as I spent all my time learning about the markets and trading strategies but spent very little time learning about taxation and its relevance to market participants. I for sure knew it was not just that, I insisted to meet someone more knowledgeable to understand the topic in greater detail. To my luck I got to meet the Regional Head of the stock broking company, enthusiastically I picked his brains about taxation for market participants; unfortunately even he reiterated the same thing that my dealer had told me. It seemed even worse as the regional manager had a sense of pride while he gave me that sloppy answer. Frustrated, I visited a CA and he essentially said the same thing that my dealer said, but he used fancy jargon and complicated the whole matter to no end. At that point in time nobody had blogged about it online, no good articles were written on the topic and thus my quest to learn taxation related to markets got squashed like a bug. In retrospect, had I known more about this topic, had I got more information – I would have clearly benefited in multiple ways. I’m certain there are many traders and investors in a similar situation as I was few years ago. In fact this is true considering that our blog on taxation (which was put up a few years ago) has received over 2000 questions! This number is besides the numerous emails received and queries asked on Trading Q&A. Keeping this in perspective, we are happy to introduce our new module on Zerodha Varsity aptly titled “Markets & Taxation”. 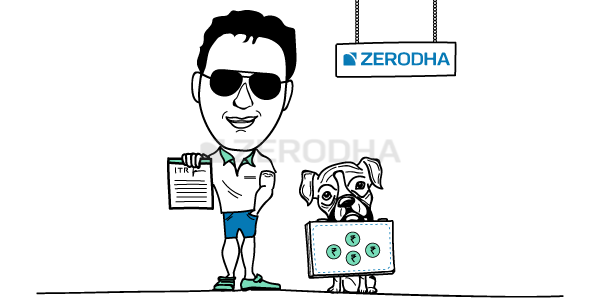 The module deals with literally everything that you need to know about taxation related to markets – be it short term capital gains, or treating your intraday trades as speculative business income, or about Section 44AD & 44ADA – we have it all on Zerodha Varsity – in one place, concise, and simplified. Now here is the best part – the whole module is authored by Nithin himself, which means that we get to learn about taxation from a trader/investor’s perspective and not really from the CA’s perspective. This makes a huge difference in terms of topic narrative. With a seasoned trader discussing taxation, we get to learn about the essential topics without digressing into the taxation wilderness. Lastly, if I look back in time, I could not imagine brokers giving out such valuable information to clients. In fact, stock brokers were always known to hoard information and pass it only to select clients. I’m sure you would agree with me on this, especially if you have been trading the Indian markets for a while now. Stock Brokers in India have always been snobby, expensive, and full of unwanted attitude. However the stock broking industry is slowly waking up to the fact that the customer, irrespective of his size deserves the best. This change in attitude is leading to a revolution of sorts in the industry – and I do believe Zerodha is the epicenter of this revolution – changing the way the Indian broking industry functions. Be it providing you high quality tools to trade, better trader education, or ready to use tax friendly reports – Zerodha has it all for you. So please do go ahead and explore this unique module on Markets & Taxation. I can assure you that the content presented here will make you more confident about matters related to taxation, and with that new-found confidence you will never have to fear the taxman! Go to the last chapter of this module Sujay, there is an excel download of a sample ITR4. A video will be tough to make. It was brilliant. Although I had read the modules and was already aware of it, it was like very good revision and it would be extremely helpful for people who are beginners. So is any other module. Keep up the good work. As you said at the end, it would be great if you can arrange for a session on filling ITR-4 form. Thanks. Hello sir I am doing intraday mainly. I want open a proprietorship firm for this perpose for myself trading only. What is procedure and I want continue use zerodha as trading account. Thanks for the suggestion Sujay. We will certainly look into it. To file and save tax for future. Question 1 -Do I need to file ITR separately for salary and FD, SIP, F&O returns? Question 3- In my PAN I find few trading activities captured in income tax India website, What action do I need to take to resolve it? Question 4- Do I really need to consult CA? Any nearby suggested contacts near to Whitefield? 5. If you file returns after due date, you cannot carry forward the loss. So you can take that benefit only for FY14/15 for which returns have to be file by Aug 31st. Sir, Could you please tell me if I am classified as trader then I have to pay tax for long term (held for more than 1 year) capital gains on stock trading? suppose i am a trader(buy and sell stocks in few weeks) lets say i bought 10 stocks worth Rs 10,000 then 15 stocks worth Rs 9000 then 5 stocks worth Rs 1000. and after sell all of them(worth Rs 20,000) i make a profit of say Rs 2000. (total now Rs 2,2000) and now again if i buy stocks worth 2,2000. and don’t liquidate the money… do i have to pay tax on the earned profit i.e Rs 2000 as the money is still invested in stocks?? 1. Show your profit booked and don’t consider the profit/loss on your investment that you hold at end of year. I have read all the modules, however was unable to get details on point 2 mentioned above. Can you please elaborate. I purchased 1000 qty of Stock A at 100 Rs and after 3 months sold 1000 qty at 150 Rs. Hence STCG of 50,000/-. However within few days (within same FY) I purchased 1000 qty of the same Stock A at 150 Rs. However since then the stock has been facing LC and I am unable to exit with the current price of stock being 80 Rs. So can I use the point 2 mentioned above to save on STCG. I’d advise it is best not to open a trading account with a normal SB account mapped if he is a NRI. Yeah, you could take a loan, no issues with that. Nithin , thanks a lot for ur prompt reply,one more doubt plz clear it,I have lots of NRI friends,most of them interested in doing trade/investment in Indian market particularly derivatives m asking for them they know investment through PIS/Pms account,but have the doubt is same day square off possible for them in equity segment?can they trade in derivatives?what will be taxation slab for them?,if not possible in derivatives trading as per ur suggestions i can receive fund fund as loan from them and trade in my resident Indian account,is there any upper limit for receiving fund from them in my SB account as loan and use it for derivatives trading ? I am a client of Zerodha.I only do Equity Intraday trading.This is the first time where I need to file ITR in my life or not I don’t know that why it would require your help. I started doing trading from 7Jan,2016 and I dont have any other source of income other than Equity Intraday Trading.In Tax P&L statement calculations done by Zerodha it is showing INTRADAY GROSS PROFIT₹-14,526.05, INTRADAY TURNOVER₹24,760.75 and TOTAL CHARGES₹5,829.67. Now my actual question 1>Is all the calculations have already made by Zerodha? 2>Do i need to file ITR as my income is within the free tax bracket of 2.5Lakhs? 1. Yeah all P&L is already made by us. You can add other amounts that you have spent like internet etc to this. This loss can be carried forward to next year. 2. It is best to file ITR. I’m a salaried person with no other income. I filed ITR-1 for the last year. It was easy as all I’ve to do was copy the digits from Form 16 to incometaxindiaefiling.gov.in website. But this year, i had few FDs and RDs for around 50K. Also I am planning to be an investor in stocks. 1. Do I have to pay tax on the gains from FD and RD? If yes, how do i file them? Which ITR form has to submitted for AY2016/17? 2. When I do invest (more than 1 year) in stocks, its tax free right? Then do I have file ITR for the same? 1. yes you have to pay tax on the gains (if your annual income is more than Rs 2.5lks). You can use ITR 1 or ITR 2 (2 if you are investing into stocks as well). 2. If you invest in stocks and book profits, yes whatever held for more than 1 year is tax free.Yeah good practice to file your ITR declaring all income. Could you please suggest me a accounting firm or CA who can take care of my auditing/filling. I am going to do in big volume but this 1cr limit always stop me. If I have a good CA then I can shed my those inhibitions. Please suggest me. thanks a lot for such a quick response. Sorry this is little different topic. But since I can reach you directly so mentioning here. When I redeem my liquid fund (much before cut off 1:30 pm time), then zerodha is paying me amount towards END of T+1 day. Whereas for same scenario other brokers like fundsindia, hdfc securities pay me at START of T+1 day. This benefit me so that I can buy stock. But because of Zerodha unnecessary delay I miss one full day. In the world when SEBI and various AMCs are trying to instantaneous redemption for liquid funds, then why is Zerodha putting unnecessary and avoidable delay in crediting my account. hope you will look into this important matter. another suggestion is to provide me equivalent margin at start of day so that I can buy stock in delivery basis (CNC). 1)I AM MAKE TRADING TRANSACTION ABOVE 1 CRORE BUT all My profit include other is below 2. 5 lakhs may i need to pay tax? 2)I MADE EQUITY TRADING WITH 2.7 LAKH PROFIT AND 2 LAKH LOSS IN SAME YEAR THAT IS 70 000( NET PROFIT) include other,may i need to pay tax? I have started trading from this financial year i.e. 2016-17. I have bought some shares and received dividend against them. I have not sold any share till now as I want to hold them for more than one year. I wanted to ask about the ITR form I should be filling and where to show the dividend income. The Long-term capital gains declaration comes only when we sell the stock/shares after a year / two right?. Do we need to declare the stocks if we are still holding it or its declared only after selling it. How is cost basis taken into consideration? We have LIFO and FIFO. For ex, if I buy 1000 stocks at 50/- and 500 stocks at 55/- I will have 1500 stocks at 83.33.. Now if I sell some 700 stocks at 60/- and keep rest as such then 2 scenarios I can assume. 1) 300 stocks at 50 and 500 stocks at 55 will remain with me..
2) 800 stocks at 50/- will remain with me.. In this case profit is 200 x (60-50) + 500 x (60-55) = 2,000 + 2,500 = 4,500.. Which case will be assumed for taxation? I m a salaried person working in a private organization. I also have a demate account in zerodha. I do intraday , short-term traiding, f&o and made profit in equity and loss in f&o in FY 2016-17 . I want to know that which ITR I have to file for assessment year 17-18. I am holding zerodha since 2014.why P&L statement showing wrong details in q.zerodha.com.is there any issues in q.zerodha or any modification happen to get the P&L statement pls let me know we heve very short time to fill returns..I raise a complinnt on 19th july regarding this.still i didn’t get response..could you pls short out the issue.. I read some of the modules and have been impressed – job well done! I live in the USA and pay taxes here(of course). I have never calculated/filed my taxes on my own and for years now I have been looking for GOOD sources to learn from. Would you know any reputable site(like yours) that can provide detail info on trading & taxation for USA taxpayers? George, thanks! Glad you liked the content here. Babypips in US is good for the trading related information, however, I’m not too sure about content related to taxation. Just wondering, shouldn’t this module on Taxation be updated according to latest tax slabs and info, if it is not already, would be of great help. Will this affect my taxation? Pls give me a note how this works? Can you please send out an explanation of how the new LTCG has to calculated for shares we are already holding in our portfolio. you’ve been doing a great work! I understand my doubts are similar, but i need a little more clarity..
1. The purpose of declaring the gains from equity trading as a speculative business income and not as STCG is to avail the benefits for the expenses incurred in terms of internet etc. Is that right? 2. I’ve been trading in CNC and MIS both. In this case, I’m not sure if I’ve to show this as STCG or spec biz income. 3. And, as I went through the modules, it was written for all STT paid transactions, we can declare that income while filing ITR. But when I see my transactions at Zerodha, the STT is shown as 0. (I’ve been trading both on IntraDay and short-term). Could you please clarify me if for these transactions if there is no STT. So I’ve read alot of stuff before leaving a comment here. 21 years old. Intra-day, Delivery, Mutual Funds (All EQ ONLY). 22k Invested. Down by 4k. Non-salaried/student. Trading is only source of income. 1. For AY 18/19, where do I show MF investment, on yet to release ITR3 form. 2. I have speculative business income right? I mean I do high frequency Intra-Day, also I invest in Delivery & MF. 3. What are the due dates? 31st July? Then who is liable to file taxes every 3 or 4 months? 4. Since I am to file before 31st July should I include income of May & June as well or is it strictly 1st Mar to 31st Apr for each year. Thank you, for this varsity. The Backoffice Reports are incorrect. FnO turnover has to be calculated as absolute sum of Profit Loss each contract pricewise. Buy = 200 Bank Nifty Options xyz strike at Rs.20. Sale= 40 at Rs.25, 40 at Rs.30, 120 at Rs.12 (avg=18.20). If all Sale is taken as avg the the T.O. = 360 (this is what Zerodha does) > Incorrect. Each sale (and buy) has to be calculated separately pricewise & absolute Profit or Loss figure thus arrived has to be added, in this case correct T.O. is = 1560 ! + Add sale premium to abs P/L figures for T.O. I started Stock ( only equity trading, no F & O ) trading with some 60000/- amount from my savings. And trading through whole year I lost 30000/-. I don’t have any other sources of income. Sir, please suggest, which ITR form should I fill up to carry forward my losses….